Banks with $50 billion of assets are currently considered “systemically important” and are governed by more stringent regulations. The Senate bill raises that threshold to $250 billion, leaving only a handful of the biggest banks facing the toughest oversight. The bill also exempts firms with less than $10 billion in assets from the so-called Volcker Rule, which prohibits banks from making risky bets with federally guaranteed deposits. Mortgage rules for small lenders would also be eased, and midsize banks like SunTrust, P.N.C. and Regions would be substantially relieved of strict regulation. “This bill is an important step in right-sizing the rules for America’s banks, and it will allow financial institutions to better serve their customers and communities while maintaining safety and soundness,” said Rob Nichols, the president of the American Bankers Association. Big banks such as Citigroup and JPMorgan Chase aggressively lobbied to tuck in provisions that would be beneficial to Wall Street, but there has been little bipartisan appetite to change the regulatory infrastructure that governs the largest financial institutions in the country. Unlike the House bill, the legislation would not touch the Consumer Financial Protection Bureau, a longtime target of Republican lawmakers who view it as an unaccountable agency with too much power. 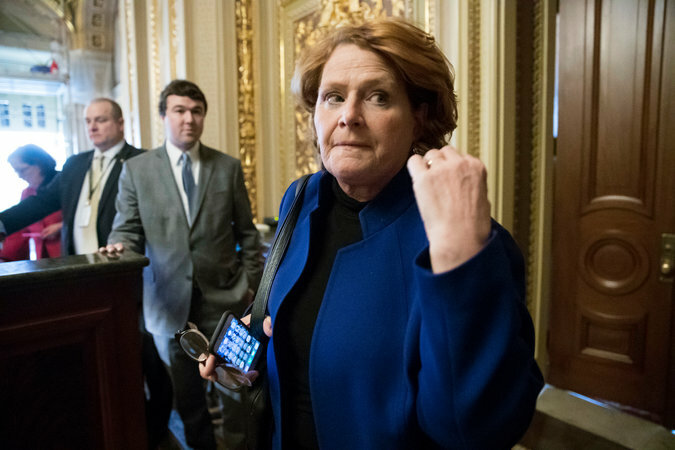 Senator Heidi Heitkamp of North Dakota was among the Democrats who voted in favor of a bipartisan bill that would ease some financial rules. Representative Jeb Hensarling, Republican of Texas and the chairman of the House Financial Services Committee, suggested this month that he did not expect his colleagues to just rubber-stamp the legislation that passed the Senate and that there would be changes to a final bill. More than a dozen Senate Democrats, several of whom are facing tough re-election contests in states that President Trump won in 2016, backed the banking bill despite public criticism from members of the progressive wing of the party. They have said that they hope to avoid a conference process with the House that could lead to changes that they would find unacceptable. “If the House overreaches in its effort to amend the Crapo bill, it could slow down the bill’s progress,” said Brian Gardner, an analyst at the financial services firm Keefe, Bruyette & Woods, referring to Senator Mike Crapo, Republican of Idaho, who is a sponsor of the measure. “What does it say about Washington that Republicans and Democrats can’t come together to support common sense gun reforms or solutions for working families — but can come together to deregulate big banks on the 10th anniversary of the start of the 2008 financial crisis?” Ms. Warren said Wednesday. Ms. Warren pointed to a Congressional Budget Office report this month that analyzed the bill and concluded that it could increase the likelihood of failure for a bank or credit union. The measure has put Senator Chuck Schumer of New York, the Democratic leader who voted against it, in the difficult position of mediating the split in his party after more than a year of holding a united front against Mr. Trump. However, before the midterm elections in November, he has given conservative-state Democrats leeway to vote as they see fit and has urged progressives in the party to tread lightly when criticizing moderates. But the dissension in the party has spilled into public view. In an interview with The Atlantic this week, Ms. Heitkamp shot back at Ms. Warren. “I think people in North Dakota don’t care what Elizabeth Warren thinks,” Ms. Heitkamp said. With the passage of the bill, the onus will now be on House Republicans to decide whether to push for more sweeping changes that will appeal to their base or settle for modest adjustments to Dodd-Frank that have a chance of passing and getting to the president’s desk for his signature. Last year, the House Republicans passed the Choice Act, which would have gutted Dodd-Frank, in a party-line vote. But the bill was considered dead on arrival in the Senate. Pressure to send something to the president’s desk will be great, as the White House expressed support for the Senate bill and urged Congress to forge ahead in hopes of scoring another legislative achievement after last year’s $1.5 trillion tax cut. Although Mr. Trump promised to do a “big number” and dismantle Dodd-Frank, the relatively modest bill that cleared the Senate on Wednesday may have to suffice. “The president looks forward to discussing any further revisions the House is interested in making, with the goal of bipartisan, pro-growth Dodd-Frank relief reaching his desk as soon as possible,” the White House said in a statement on Wednesday.